Spring is coming soon and that means it’s time to line up your spring holiday crafting projects! We’ve been doing a few St. Patrick’s Day themed project in the studio the past few weeks. I’m sharing three of them here in this post and the last one, the Blessings Wall Hanging, has some step by step photos of the entire project. We are also be giving away some St. Patrick’s Day bling in our Jubilee Rhinestones store so be sure to check that out if you enjoy the giveaways. Chevron, anyone? Jubilee Fabric has some really cute chevron burlap ribbons in stock now. This green chevron was just begging to be implemented into a St. Patrick’s Day craft! These two projects were incredibly simple and they both turned out very nicely. 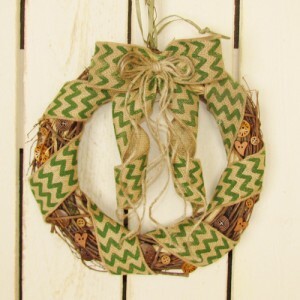 The grapevine wreath was purchased at our local craft store and then simply wrapped with the green chevron burlap. 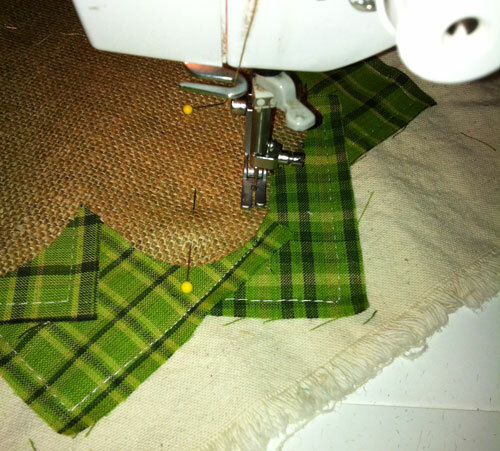 The edges of the burlap are wired so it stays where you put it and the bow is easy to shape. After the ribbon and the bow were secured with hot glue, we glued a random assortment of our wooden buttons to add interest. Who doesn’t love to see a little girl with a bow in her hair? 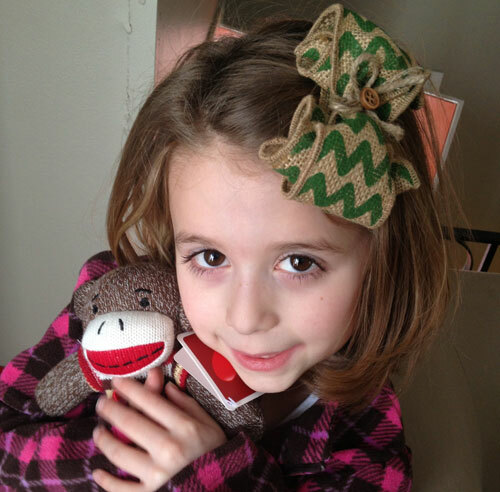 Flora’s aunt made this St. Patrick’s Day bow for her out of the same green chevron burlap ribbon. We love the unique design of the bow and since this bow is simply green chevron burlap, it will keep Flora from getting pinched on St. Patrick’s Day AND it will be adorable with any green outfit for the rest of the year! I’m thinking this could even look really cute with something for Christmas as well. This adorable door decor was created by our digital designer, Sara. Obviously, Sara’s design skills go well beyond digital art! 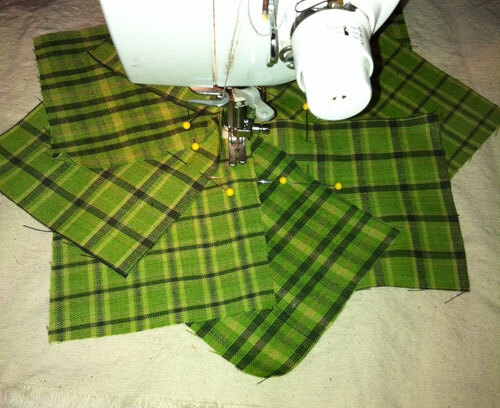 She stitched together some 4″ squares cut from our Shamrock Green homespun fabric. 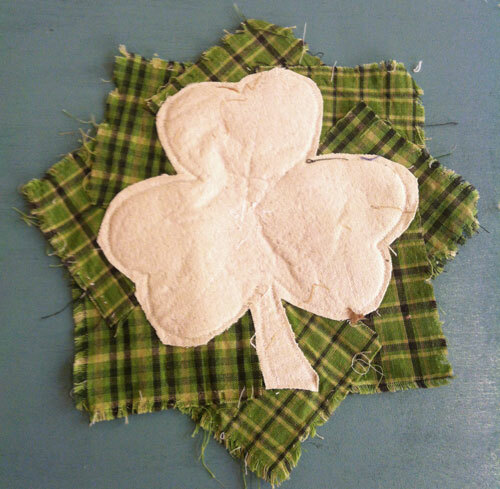 Then Sara cut a clover design from the stitched squares, clipped the outer raw edges just a bit and washed it in the washing machine to fray those clipped edges. 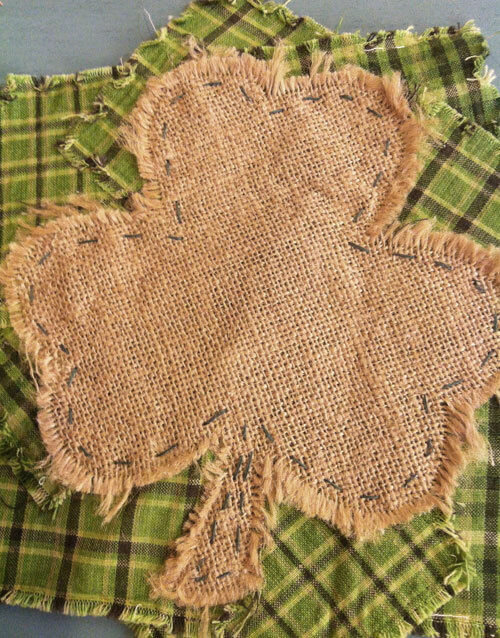 She cut a larger clover design from burlap and glued the washed fabric clover onto it adding a bit of polyester fiberfill in between the two layers. This makes the fabric clover just a bit puffy and gives it a 3D effect. Just a simple piece of burlap or jute glued to the back will make a nice hanger. The finishing touch of some green rick rack and a burlap bow makes this a totally unique and adorable door or wall decor. 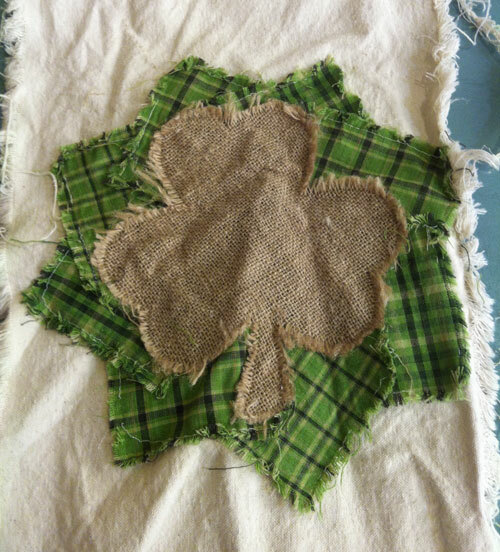 In researching a bit about St. Patrick’s Day, I discovered a number of really beautiful “Irish Blessings” which have apparently been passed through the generations in Ireland. This inspired me to create a holiday wall hanging that quoted a phrase from one of the blessings. The hardest part was picking which phrase to use but I finally settled on “May God bless you and be with you.” I used the Custom Rhinestone Word option in the Jubilee Rhinestones store to create the text in sparkling green rhinestones. Following are some step by step pictures of the project in process and some brief instructions on how to make something similar. * Its important to use homespun fabric. Regular cotton won’t fray well. 1″ frayed edge burlap ribbon or thick jute string for hanger. 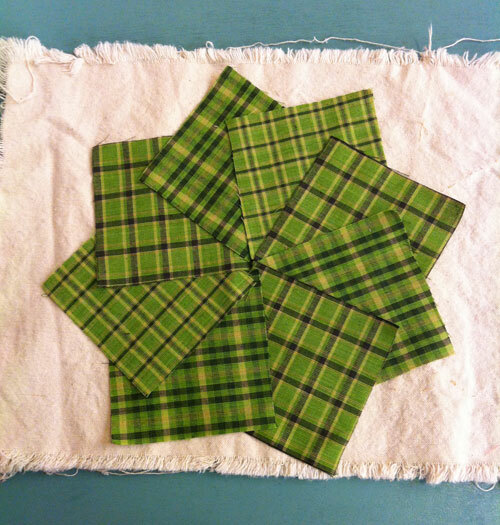 Lay out your four inch squares in a pinwheel design onto the center of your scrap canvas fabric. Pin the centers into place but leave the outer edges loose. 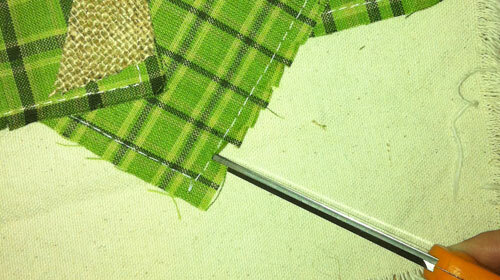 Begin with any square and stitch the three visible sides down by stitching about 3/8 inch from the raw edge. 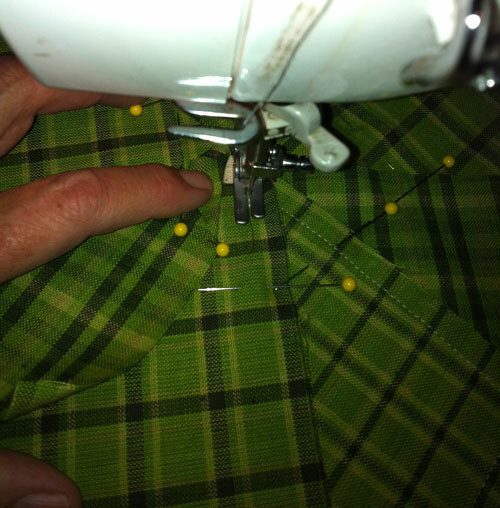 Use a contrasting color fabric and a long loose stitch because you will be removing this stitching later on. 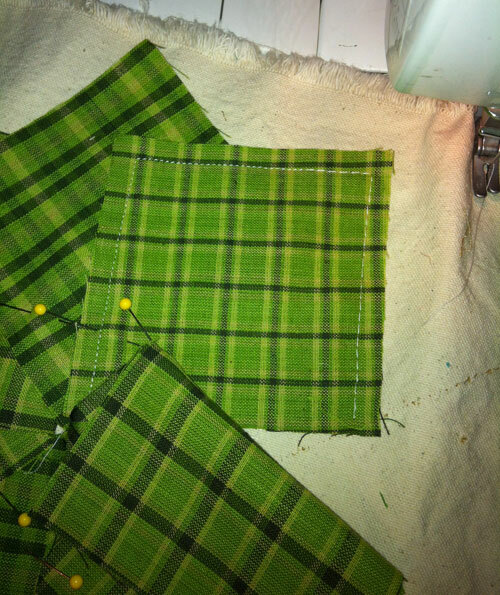 For each square, you’ll need to fold the square next to it back so that you can stitch three sides. 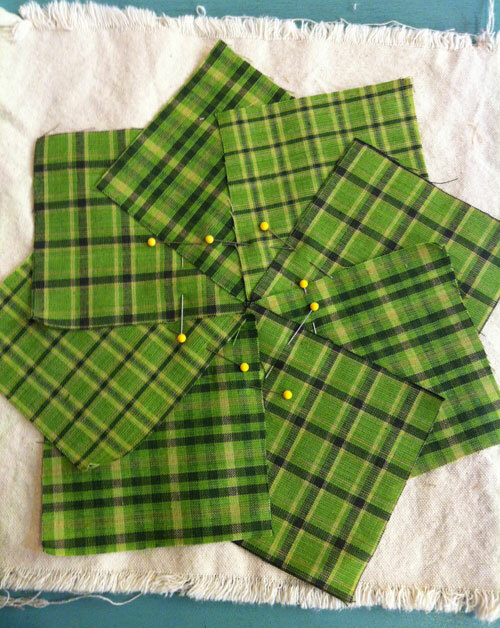 Continue all the way around the pinwheel stitching the three visible sides of each block individually. Stitch the last square as far as you can, folding back the first square and stitching right up to the stitch line. 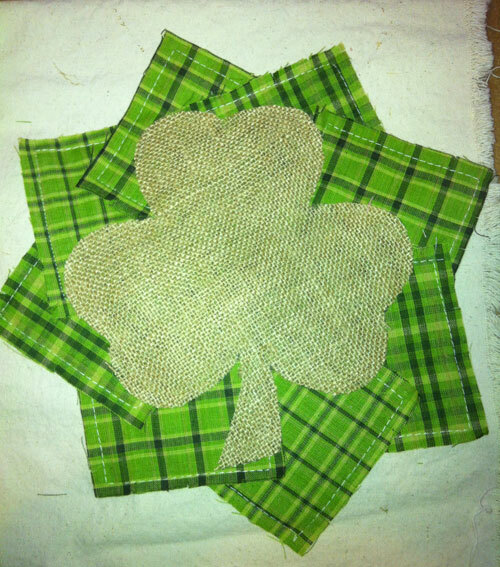 Cut a clover shape from the burlap piece and pin it into the center of the pinwheel. 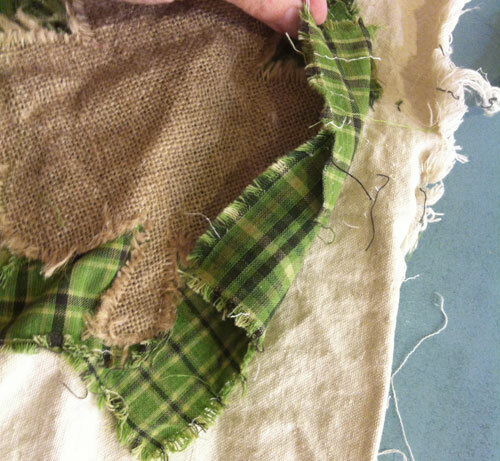 Stitch in place by stitching about 3/8″ from the raw edges of the burlap. Use a small tight stitch and a coordinated color thread this time because this stitching is not coming out! 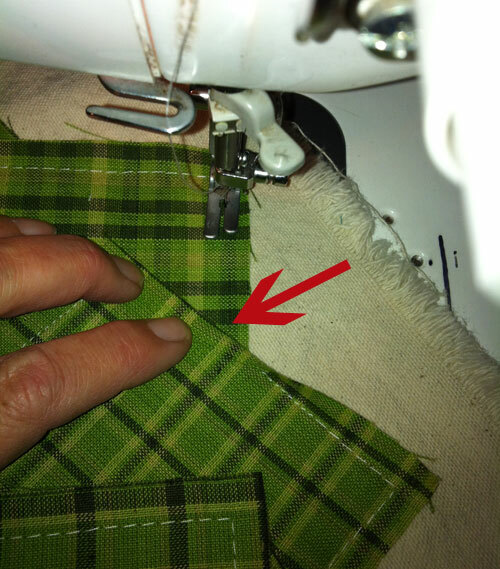 Now clip the exposed raw edges with small clips about 3/8 – 1/2 inch apart. Be careful that you don’t clip into the stitching. Machine wash and dry this piece to fray the exposed edges. After it’s removed from the dryer, press from the back side to remove wrinkles. 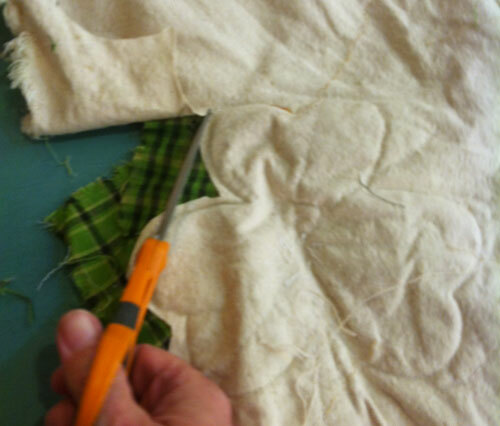 Remove the outer stitching around the pinwheel but leave the stitching around the burlap clover intact. Cut away the scrap canvas fabric backing by trimming from the back side really close to the clover stitching. 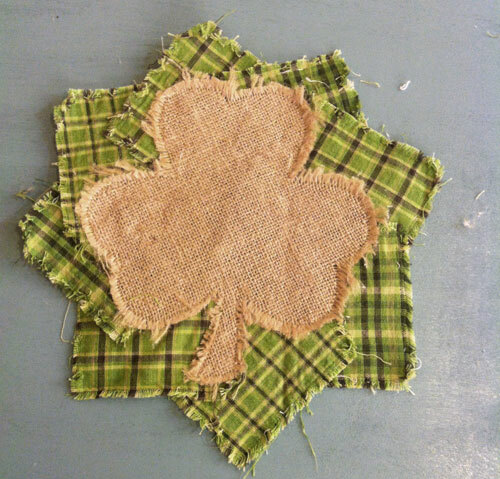 Use green embroidery floss or thin green yard to stitch some giant hand stitches around the burlap clover to outline it. 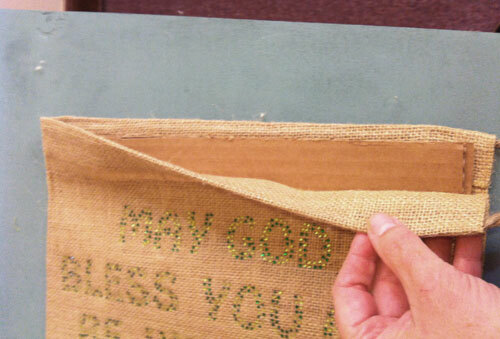 Now use a hot glue gun to glue this onto your burlap drawstring bag with the drawstring opening at the top. Apply your lettering of choice to the top portion of the bag. We used iron on rhinestone letters from Jubilee Rhinestones. 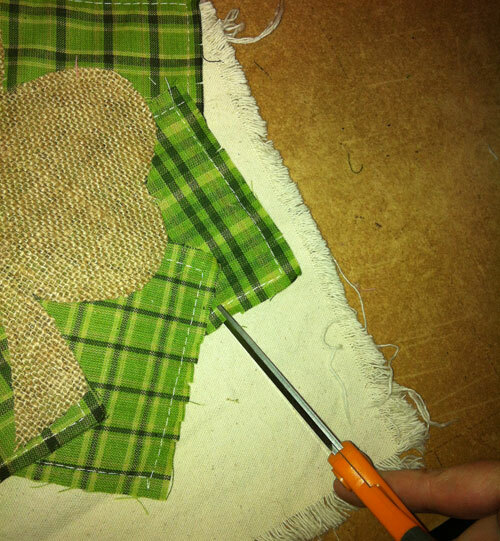 Now glue the cardboard piece into the top of the bag between the front and the back about 1/2″ down from the top edge. Glue both front and back sides. Then glue the very top together sealing the cardboard inside the bag. Glue the buttons onto the 1″ frayed burlap ribbon and glue each end of the ribbon to the top corners of the bag to make a hanger. This jute twine can be used in place of the ribbon if you wish. There you have it! 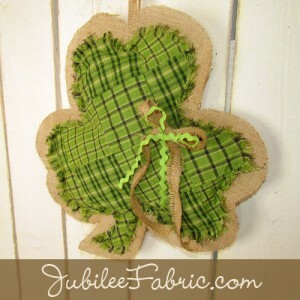 A cute burlap Irish Blessing for your door or wall. The advantage to using the burlap bag is that all the edges are already finished off for you and it’s such a perfect size for a door hanging. I may be making more of these for future holidays this year. Did you like the rhinestone lettering that we used? 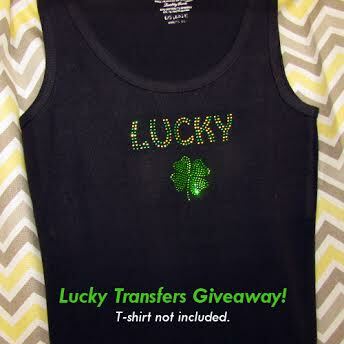 We are giving away a similar iron on that says “LUCKY” in the two tone green rhinestones. You can enter the giveaway here. Entries will be accepted until March 11, 2014.